Class: Sophomore Hometown: Wexford, Pa.
NOTES: Two-year letterwinner and starter... 2015: Appeared in 101 sets over 31 matches... Led team with 36 service aces... Second on team in kills (235) and kill average (2.33)... Third in total digs (260)... Reached double-digit kills 10 times and double-digit digs 11 times... Season-high 13 kills on four occasions... 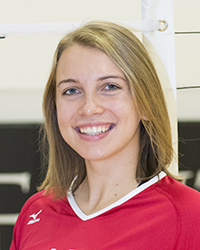 Matched career-high with six blocks to go with nine kills against W&J... Posted 13 kills and 20 digs in regular-season finale at W&J... 2014: Starter at outside hitter... Appeared in 100 sets over all 29 matches... Led team with 35 service aces... Second on team in kills (227) and third in digs (351) and blocks (39)... 18 kills and season-high six blocks in first collegiate match against Earlham... Career-high 19 kills and 10 digs in five-set win over Captial... Posted 13 kills and 19 digs against Thomas More... Season-high 28 digs against Saint Vincent.